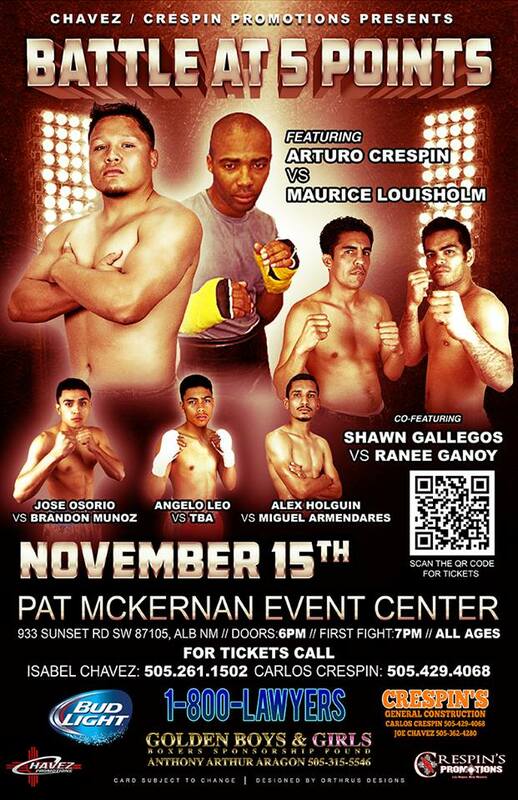 Another boxing card will be hitting the McKernan Events Center in Albuquerque, New Mexico’s South Valley on Saturday November 15th as Chavez Promotions and Crespin’s Promotions present’s “Battle at 5 Points”. After two main events that were supposed to feature Albuquerque’s Josh Torres fell through the event will proceed with a new set of headliners as a very compelling middleweight bout between Las Vegas, N.M.’s Arturo Crespin (12-3-1, 4KOs) against undefeated Maurice Louishome (7-0-1, 4KOs) of Colorado Springs, Colorado has been set. Moving up to co-main event will be Albuquerque’s Shawn Gallegos (19-5, 5KOs) who is coming off a tough unanimous decision bout to Cristian Cabral against Filipino-born and Albuquerque-based veteran Ranee Ganoy (31-11-2, 31KOs). Tickets to “Battle at 5 Points” run between $30-$70 and can be purchased by clicking HERE.